When You Can’t Do an Island Vacation, Bring One to You! It is cliché, but we are all busy. In our pursuits, passions, dreams, relationships, and all the craziness that comes with life, we are busier than we were a few years ago. But in the midst of the crazy, we crave our girlfriends. We all need time to kick back and be with our closest ladies to not only catch up but to have fun with each other. From trying something new to gathering around the table and enjoying real conversations to getting creative together, there are plenty of things we can do. 1. Try a new restaurant. If you and your friends are like my circle, you can get into a rut when it comes to gathering spots to enjoy good food. Switch it up and try that place you have all been dying to go to or the newest spot in town everyone is raving about. Now, this is not an adventure per se, but ditch the yoga pants and comfy clothes for a night. Put on your favorite date night outfit and go to that new restaurant, the movies, or a dance place in town. I have personally never done this, but some of my friends have. Go dancing! There are probably swing dancing or jazz clubs in town, or if you are in the south like me, you could go to a line dancing spot. If there is nothing in town, move the furniture and have a dance party. There is nothing like being silly and having fun with your girlfriends. 4. Have a good old-fashioned slumber party. Grownups can have sleepovers. Pick a weekend and gather together. Blow up the air mattress and watch your favorite movies, play games, and eat your favorite junk food. It is fun to visit old past-times. Here are my top 10 ideas for your next girls’ night out! 5. Go on a girls’ trip. Better than a slumber party is going on a mini vacation with your girls. It could be multiple nights or even just a day trip. Go somewhere you have never been before and explore. Pick a date, make your budget, create a playlist, and go on a wild adventure. 6. Host a comfy potluck. Have everyone bring their favorite dish, dress in their cozy clothes, and gather around the table. There is nothing like eating your favorite food and enjoying the company of your girlfriends. No big agenda, just love. No matter where you go or what you do, a night where you ask the tough questions and have a heart to heart is a good night. Make sure the environment is safe, and get real. 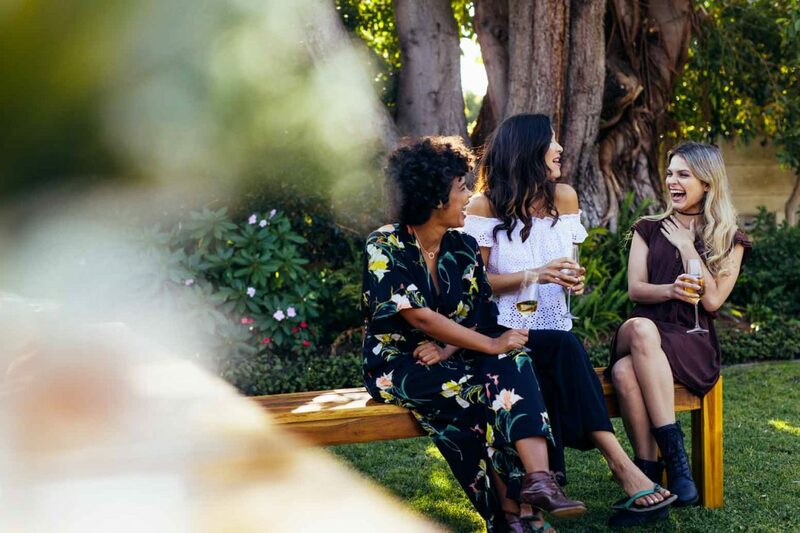 Life is too short to have the shallow conversations—even on a girl’s night. 8. Go bowling or throw plates. Some weeks are just a bear for all of us. Bowling and throwing plates are great activities to get out the anger and frustration, without causing physical harm to the annoyances in your life. Some cities have a place where you can throw plates, but you can create a space in your garage or backyard to throw plates. Buy some dollar store ceramic plates, a tarp, safety glasses, and a hard surface to throw against. Gather your girlfriends and re-enact the scene in Princess Diaries where Mia and her mom throw darts at paint filled balloons. It is super fun and is a fun way to get out the aggression from a long week or tough season while creating a beautiful piece of art. You will need a hard surface, water balloons, darts, and safety glasses. Maybe your friends write and draw, or maybe they feel creatively challenged. Wherever you land on the spectrum, open up the evening to creative expression and enjoy the company. Gather together art supplies of various varieties and just create together. This could be vision boards for the new year that encapsulate your word of the year. Get abstract on canvas. Host a night of getting creative. The possibilities are endless! No matter what you end up doing, remember that you all deserve this time. GNO doesn’t have to happen at night. It might make more sense to gather in the afternoon. Do not feel guilty about taking time to be with your girlfriends. We need friend time, and honestly, it does not have to look like any of these suggestions. It could just be coffee and dessert in one of your homes or out at your favorite place. It could look like taking a walk at the park or even meeting over a group chat when all are separated by time zones. Please meet together and try to do it often. I know you need it because I need my girlfriends too. Don’t miss this podcast episode from This Grit and Grace Life: Great Friends: 9 Qualities to Be One and Find One – 031!